There are weekends, and then there are motorsport weekends. While you get to kick back and relax during the former, the thought of lazing around doesn't even cross your mind during the latter. No, instead you're all jittery, switching between multiple channels, going from website to website following live timing (it's faster than the TV broadcast, of course), and also checking Twitter updates from your favourite teams, drivers and riders. Well, the weekend that just went by was exactly that. It started with a cracker of a race at 2013 MotoGP on Saturday (June 29), and moved on to super Sunday with a Sykedelic performance at World Superbike Championship, followed by an explosive Formula 1 race, and an epic record-breaking Pikes Peak Hill Climb. Missed it, did you? Well, here's why you really shouldn't have. It's only fitting that we start with the most significant piece of news first. 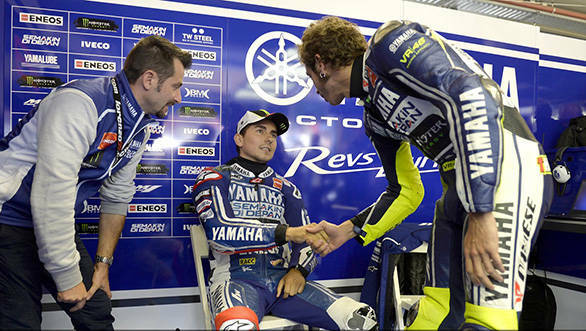 Valentino Rossi came to Assen, took a look around, and decided that it was at this very track that he'd like to end his winless streak. It didn't matter that he started the race fourth on the grid. By the time the first six laps were done, Rossi had carved his way to the head of the field with precision and that's where he stayed till the end. He won the race in a commanding fashion, looking like the Vale of yore, and proving to the world that he'd never gone anywhere. Yes, his last win might have been at Sepang in 2010, but with this win, it looks like Rossi has well and truly put the two miserable years at Ducati behind him. Will he be a serious championship contender this season? He could very well be. 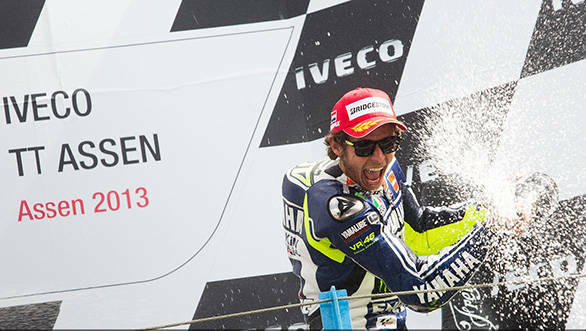 Just so you know, the win at Assen is Rossi's 80th win in the premier class and 106th in Grand Prix motorcycle racing. Is he then gunning for Agostini's record of 122 wins? We sure hope so! While Rossi's win might have been the most significant part of the race at Assen (we hear the celebrations went on till the wee hours), there were other aspects of the race that were more than just commendable. Let's start with Cal Crutchlow. 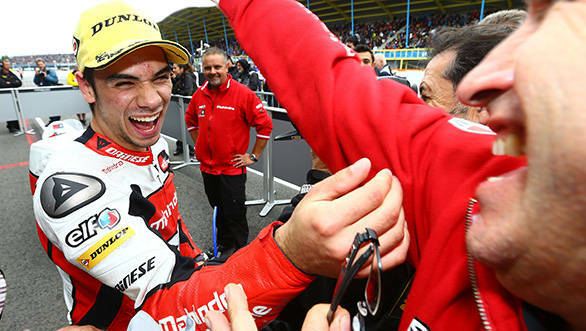 The British rider has spent the first few races of 2013 climbing to the head of the MotoGP pack, something he proved even further when he took pole at Assen. Even though he wasn't able to translate that into a win, a third place, and the way he picked people off along the way, proves Crutchlow is a man who could do with a factory ride sooner rather than later. 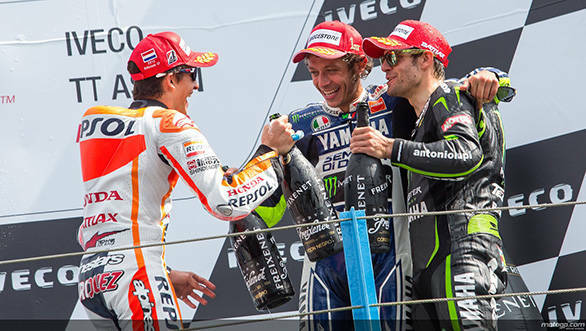 But Crutchlow was overshadowed by the heroic ride from Jorge Lorenzo. The reigning world champion crashed on Thursday, broke his collarbone, had a titanium plate with eight screws fitted in, and still managed to ride on Saturday. He finished the race fifth, in excruciating pain, but it didn't seem to matter to him. He'd prevented Pedrosa and Marquez from making too big a dent in his championship and that was all that counted. Moving on to Formula 1, then. Imagine having a tyre blowout at 190 mph. That's exactly what happened to four drivers at the British GP. To put things into perspective, Formula 1 hasn't had a tyre fiasco this big since the 2005 US Grand Prix. Following the 2005 fiasco, all the Michelin runners had pulled out of the race after the tyre manufacturer deemed its tyres unsafe for that particular race. Current F1 tyre maker Pirelli, however, has been working on manufacturing tyres that degrade easily, necessitating multiple pitstops for tyre changes. So we're still unsure as to what exactly caused the tyre blowouts, and the FIA is conducting a rather grim-faced investigation as we type this. What we do know is that as drivers went over the kerbs at the exit of Becketts and the kink at Aintree, the left rear tyres experienced stresses that made them shred into wisps of black, certainly no good on a racetrack. Drivers Lewis Hamilton, Felipe Massa, Sergio Perez and Jean Eric Vergne were all rather startled by this. Lewis was probably the most upset, given that he was leading the race up until that point. Whoops! If you wanted unpredictability, the British GP had plenty of it. After Lewis Hamilton's hopes of victory blew up with the tyres, it was Sebastian Vettel who took the lead. Vettel led until lap 41 when he suddenly began coasting along the track and finally came to a stop on the main straight, while the F1 fans in the grandstands appeared to be cheering about the fact that he was out of the race. 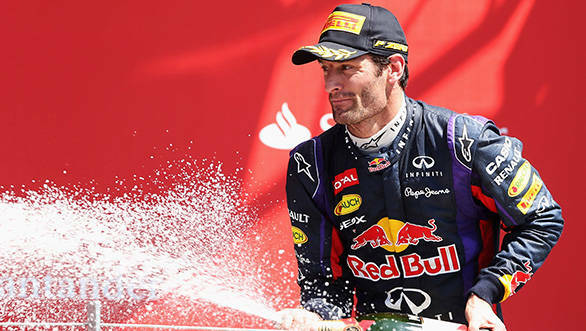 His team-mate Mark Webber, who is about to bid Formula 1 farewell forever, had a good race following his announcement that he would be leaving for the World Endurance Championship at the end of the year. As soon as Vettel's car was cleared from the main straight (apparently the gearbox had packed up), and the Safety Car was sent back into the pits, Webber made up places. As the race was drawing to a close, he put himself onto the podium. Soon after that, he edged Kimi Raikkonen to second place. Even though he was clocking faster laps than the man at the head of the order at that point, Webber had to stay content with second place. Perhaps if he'd had four more laps he'd have been able to go for the win. Going for the win, in this case, was Nico Rosberg, something we're particularly pleased about. You see, for the last three years in Formula 1, the young Rosberg has been overshadowed by his team-mate Michael Schumacher. It didn't really seem to matter that he'd been consistently outperforming Schumacher, because the attention was always focused on the seven-time world champion. There was the real danger of this happening this year as well. If Fernando Alonso couldn't deal with having Lewis Hamilton as a team-mate, what chance did Rosberg have? Now credit must be given where it is due - Rosberg has been holding his own all through the season this far. 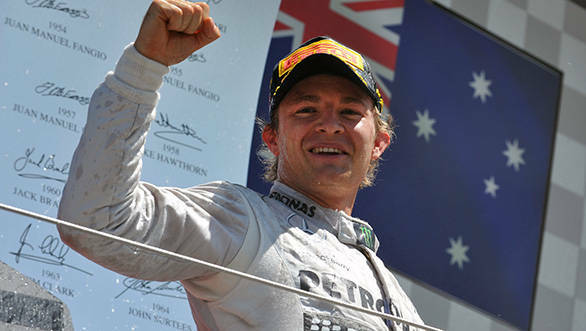 Hamilton might have been put out of contention for a win when his tyre blew up, but Rosberg had his race under control. He was fast and hunting down Seb Vettel, and the fact that Vettel's RBR suffered a transmission failure just helped make his life easier. That's two race wins for Rosberg at Mercedes this year. And none for Lewis. Nice one, Nico! Kawasaki fans ought to be pleased with the latest developments over at the World Superbike Championship. After all, it's the first time since 1994 that the head of the WSBK championship standings sees a Kwacker on top. Tom Sykes appears to be getting better and better. 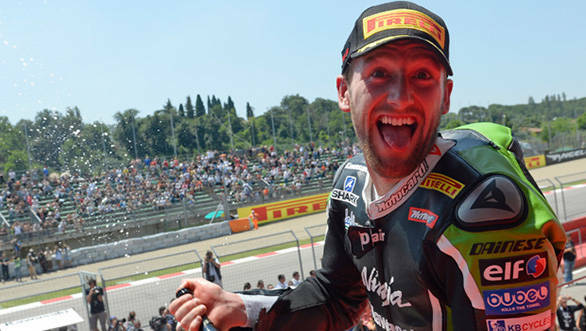 At this round of the championship at Imola, Sykes did everything he could to ensure he put in a concerted battle for the championship. What did that entail? Winning both races, of course. He was helped to victory in Race 1 when Sylvain Guintoli crashed out of contention. And then, in a repeat performance of his double at Donington, Sykes led Race 2 from start to finish. Result? He now leads the championship, six points ahead of Guintoli. It's going to be a Kwacker of a season. Sorry, we couldn't resist. What good is motorsport weekend without some Indian hopes in the fray as well. In the wonderful world of MotoGP, it took the form of Mahindra Racing. Miguel Oliveira gave the Indian Moto3 team their first pole position on the MGP30 during qualifying at Assen. The race itself was a hotly contested battle with the top five riders scrapping for position. While Oliveira battled hard, he wasn't able to hold onto the lead, eventually missing out on the podium by 0.096 seconds behind the third placed finisher. Luis Salom won, with Maverick Vinales second and Alex Rins third. There's another Indian team out in the world of motorcycle racing. Well, Mahi Racing's exploits in the World Supersport category of the World Superbike Championship just keep getting better. 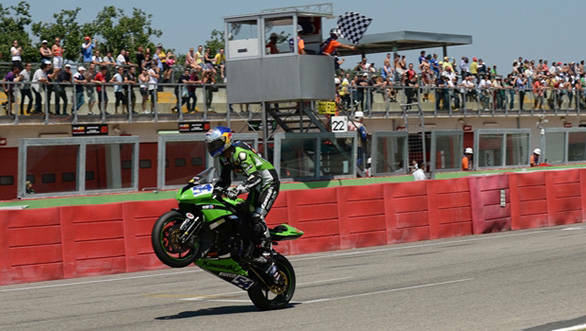 Kenan Sofuoglu won the race at Imola, snatching the lead on the first lap and not letting anyone challenge his position till the race was red flagged due to oil on the track. His win means he is now second in the championship standings and might well make up the 35 point deficit to Sam Lowes in the next few rounds. We can't wait! We saved the best for last. What is it about Sebastien Loeb? That's a question that seems like it won't ever be answered satisfactorily. In any case, when Loeb said he was going to try his hand at the Pikes Peak Hill Climb, people were interested. There was no doubt that Loeb would do well. How well was the question. 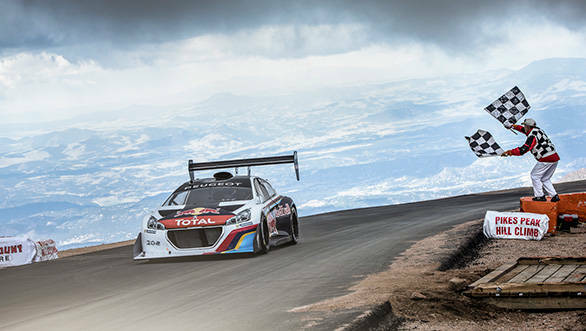 Then we saw the Peugeot 208 T16 Pikes Peak that they'd tricked out for him - 875PS, weighs 875 kg, and needless to say, goes like stink. So Loeb went over to that famous mountain, the one that Ari Vatanen claimed back in the eighties and put his foot down firmly on the accelerator. The result? Well, Rhys Millen's record was 9min 46.164 seconds. Loeb smashed that one, he did - 8min 13.878 seconds. Honestly, what is it about Sebastien Loeb?